After buying two instant tickets, Rob Amos managed to win just $10. 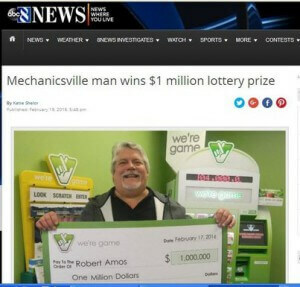 Far from being satisfied with the tenner, Amos decided to use the winnings to purchase a third ticket. His third attempt proved to be the lucky charm. When scratched, the third ticket revealed a $1 million win! He chose to receive a single payment of $537,393 before taxes instead of getting the full million over a period of 30 years. The 7-Eleven at 6689 Cold Harbor Road in Mechanicsville received a $10,000 bonus for selling the winning ticket.